Last night’s episode of SmackDown was baffling but eventful. Twelve days before WrestleMania, Charlotte Flair defeated Asuka to become the SmackDown Women’s Champion in a stunning finish to a title match no one expected. What exactly does this mean though? Charlotte’s eighth title win over the champion, who has barely been on television, raises so many questions. What happened to the fatal four-way WWE scheduled last week? It was announced online and it was scrapped in even less spectacular fashion. Above all, what does this mean for Asuka? Admittedly, this change in direction was infuriating at first. Surely, Asuka deserves better than this. She hasn’t had much to sink her teeth into as champion since Royal Rumble. Now, her uneventful title reign is already coming to an end in a random non-pay-per-view match. To add insult to injury, The Empress of Tomorrow possibly just lost her spot on the WrestleMania card to someone who’s already set to headline the event. The very same woman, who ended her streak last year to mixed reactions, will walk into MetLife Stadium as champion. 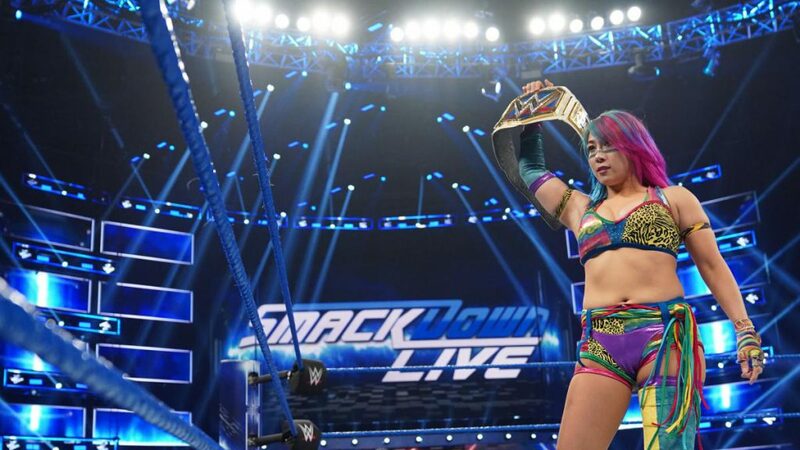 Recently, WWE Hall Of Famer Jim Ross claimed, “the ball was dropped last year at WrestleMania after [Asuka] lost her undefeated streak to Charlotte.” It’s hard to disagree with that when you consider the potential that was there for more storylines. Not to mention the subsequent booking decisions, which left much to be desired. Is this more of the same negligent booking though? It’s tough to tell. On the surface, it sure seems like it. However, this could be the best possible decision for Asuka and Charlotte going into WrestleMania. The decision to just hand Flair a title match is not only perfectly in line with the story WWE has been telling so far; it garnered the appropriate response. In short, fans should be mad. Charlotte is Vince McMahon’s hand-picked choice, who was given a spot in the main event that Becky Lynch had already earned. Now, she’s seemingly taking an opportunity away from five other women when she has already been gifted the highest honor. That should aggravate even the most reasonable fans. That’s also why Charlotte’s inevitable and humiliating defeat will feel so rewarding. Whether you like the decision to crown her SmackDown Women’s Champion or not, there’s no denying WWE has masterfully taken real grievances into consideration and molded Flair into a more compelling heel character. Even more, they effectively pulled off the double turn most naysayers wanted after SummerSlam. This further proves Becky was right about “The Queen” all along. That brings me back to my initial question: what does this mean? For starters, this adds stakes to the six-woman tag match scheduled for next week’s episode of Raw. Something this week’s Beat the Clock challenge was sorely missing. Remember, the stipulation is Charlotte, Ronda Rousey, or Lynch will forfeit their WrestleMania spot if they betray their teammates. This gives Flair, who has lost control and got disqualified in the past, more to lose. It seems unthinkable, but how fitting would it be if she lost her spot in the triple threat match? It’s no secret fans have been clamoring for a one-on-one match between Becky and Rousey anyway. This could be the best scenario for WWE to make that happen and set up a rematch between Charlotte and Asuka. More importantly, the SmackDown Women’s Championship does feel like it matters again. Yes, it’s disappointing that someone like Naomi or Sonya Deville won’t get a chance to challenge for the title. But even so, this gives the company the unique opportunity to build a trilogy off arguably the best women’s WrestleMania match. Moreover, this adds intrigue that last year’s showdown lacked without a defined heel vs. face dynamic. If Asuka could finally overcome her biggest test at “The Show of Shows”, it would cement her as a star. The possibility means so much more than any of the alternatives the fatal four-way would’ve presented. After losing steam in the last few weeks, this could also be the shot in the arm the main event needed. Even if this doesn’t lead to the ousting of McMahon’s golden child, there’s the chance this could be a way to unify the women’s championship. That’s less exciting but it does add more suspense. No matter how last night’s match made you feel, it did serve a purpose. WWE did manage to get everyone talking about the main event again, and not just because of its historical significance. It’s unclear where this will lead but they’re at least keeping us guessing. What do you think? Could this lead to dual main events or a new Undisputed Women’s Champion? Drop a comment below.